Genichesky district of the Kherson region joined the world-wide campaign United with Flag. 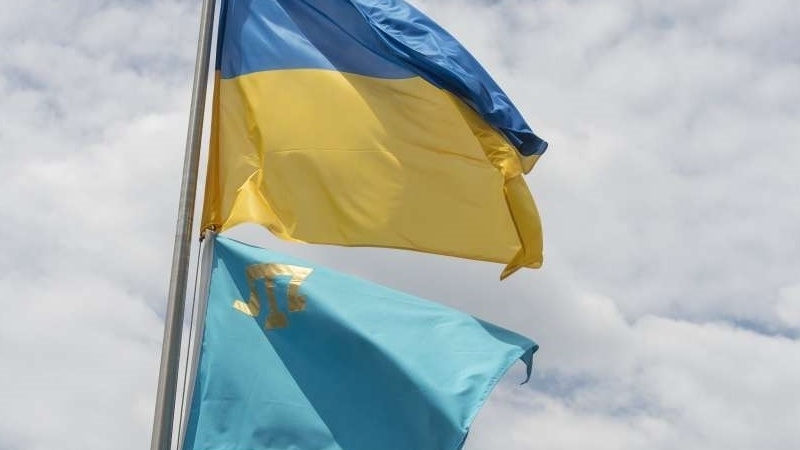 Two state flags of Ukraine and one Crimean Tatar flag, were brought to the Genichesky district, along with 15 flags from the countries where this action took place. The flags were unfolded at the administrative border with the occupied Crimea at the checkpoint "Chongar". The event was attended by representatives of the authorities and the Majlis of the Crimean Tatar people, political and public figures. In particular, a member of the Majlis of the Crimean Tatars, Eskender Bariev, took part in the action. According to one of the organizers of the United with Flag campaign, the chairman of the Association of Ukrainians in Ireland, Mykola Krutsyk, he could not even imagine that the campaign would go forward at such a gait and receive mass support in different parts of the world. The point of the action is that Ukrainians who live abroad, remembering their native land, express her support for it. The Ukrainian flag travels to different cities of the world, where people leave their signatures in support of Ukraine. Earlier, on August 23, on the occasion of the Day of the State Flag of Ukraine, a motor rally started from Genichesk (Kherson region) to the checkpoint of entry / exit Chongar at the administrative border with the occupied Crimea.